Himesh Jitendra Patel (born 13 October 1990) is an English actor, known for his role as Tamwar Masood in the BBC soap opera EastEnders, which he played from 2007 to 2016. Patel was born in Huntingdon, Cambridgeshire. He attended Prince William School & 6th Form in Oundle, Northamptonshire. Patel began his acting career playing Tamwar Masood in the BBC soap opera EastEnders. His first appearance was in the episode shown on 1 October 2007. 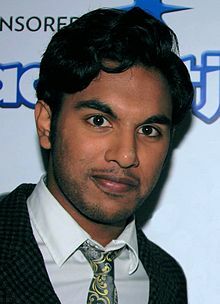 Patel also appears as Tamwar in the 2010 spin-off series EastEnders: E20, and co-wrote an episode of EastEnders: E20 with EastEnders co-star Charlie G. Hawkins. Patel's departure from EastEnders was announced on 12 March 2016. He played the role of social worker Nitin in Channel 4 sitcom Damned from 2016 to 2018. He is a member of the National Youth Theatre. He is set to appear in the upcoming 2019 film The Aeronauts. He is starring in the upcoming 2019 film Yesterday, directed by Danny Boyle. In 2014, Patel starred in the short film Two Dosas as Pavan. ^ "Awards for "EastEnders"". Internet Movie Database. Retrieved 27 March 2009. ^ "Himesh, 17, joins EastEnders". Peterborough Evening Telegraph. 16 October 2007. Retrieved 2007-10-16. ^ Kilkelly, Daniel (12 March 2016). "Bye Walford! EastEnders' Maddy Hill and Himesh Patel are leaving their roles as Nancy Carter and Tamwar Masood". Digital Spy. Retrieved 12 March 2016. This page was last edited on 12 March 2019, at 02:16 (UTC).